Grimm Otogi, a farflung descendant of the renowned Grimm Brothers, has always regarded the fairy tales his ancestors concocted as pure fiction. Unfortunately for the introverted half-Japanese teen, he is about to discover that the Grimm legacy is anything but pure. Upon receiving a posthumous letter from the father he never knew, Otogi transfers to a new school and moves into an abandoned mansion as part of his inheritance. There, he finds a manuscript that reveals the truth about his ancestors: the Brothers Grimm made a deal with mystical beings known as the Märchen Demons, who now have a claim on Otogi's life. 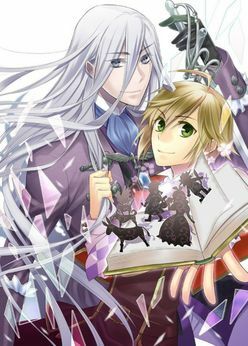 With a dashing male Cinderella as his guide, can Otogi Grimm unlock the power of the manuscript and stop the fairy tale demons before they destroy him first? A 540-page omnibus collection of the manga trilogy about the Grimm Brothers' most notorious characters!